When a new national budget is unwrapped in a country like Bangladesh, criticisms and queries do, usually, come aplenty from various interest groups and experts. For obvious reasons, it is almost impossible to prepare a budget that would satisfy everybody. The men in-charge of budget preparation burn midnight oil to locate the revenue sources and distribute the same among too many 'claimants' to public resources. The task of mobilising resources, undoubtedly, is arduous, for most people do not like to be taxed, in any form. In such a setting, when the government comes out with a bloated expenditure plan, the people have reasons to raise questions about the basis of preparing the budget. Besides, the utilisation of resources is done imprudently on most occasions. The government's lack of capacity in the matters of mobilising resources and spending the same do make things even worse. 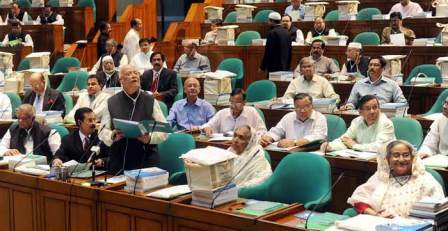 These observations are based on the analysis of the budget which was announced by Finance Minister AMA Muhith late last week and also the ones he placed in the preceding fiscal years (FYs). It has been more of an annual routine exercise of the government to prepare a 'mega' budget and, later, revise it downward. But the actual rate of implementation falls even below the revised targets. The government, however, is not deterred by such failures and it continues to present big budgets. This is nothing but playing to the gallery. For instance, the actual spending in the FY, 2016-17, fell short of the budgetary target (original) by more than Tk 700 billion while the actual size of revenue (tax and non-tax) mobilised in the same fiscal was Tk 400 billion less than the target set in the original budget. The gap could be even bigger in the outgoing fiscal, 2017-18. Yet the government has placed a Tk 4.6 trillion budget, the largest ever, for the next fiscal, 2018-19, and this has been done without making any serious efforts to enforce tax reforms or improving its capacity in relation to implementation of budget including the annual development programme (ADP). The making of unusually large budgets also comes under scrutiny in the context of the quality of expenditures. For instance, nearly 50 per cent of the 'operating budget' for the FY '2109 is meant for financing pay, allowances and pension payments of public servants, interest payments and subsidies and incentives. There is no denying that interest payments and subsidies do indirectly bring some benefits for the taxpayers. But no less important issue is how judiciously the government spends the money it borrows from domestic and external sources. The presentation of national budget in parliament is a mandatory task in a democracy. But the budget loses any relevance to democracy and also to people's welfare if it is prepared in a non-transparent manner and benefits only a selected few. If prudence is applied and transparency is maintained in mobilising resources and spending the same, the people will have no reasons to grumble. The ultimate outcome of such budgets would, instead, make them happy. Hopefully, the policymakers would give up the penchant of presenting an 'election budget' every year and would try to make a welfare-oriented budget.